THQ Nordic's net sales also increased by 441 percent in 2018's last quarter. We were a bit lukewarm on it, but Darksiders 3 looks like it's performed as well as publisher THQ Nordic had hoped, and Darksiders remains one of the publisher's key series. It's a simpler, more combat-focused outing than its predecessors, lacking in the puzzle, platforming and loot departments. 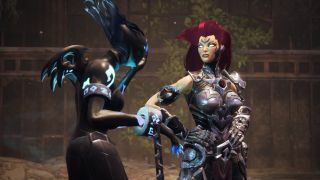 Samuel Horti gave it 63 in his Darksiders 3 review, but despite a slightly tepid critical reception, it's sold well enough to recoup its investments and marketing budget, according to THQ Nordic's latest financial report. To give the game another boost, DLC is due out this year. DLC was always part of the plan, however, with two new adventures announced in 2018. Elsewhere in the report, CEO Lars Wingefors also touched on the subject of distribution platforms and "new entrants". "I see the gaming market as more vibrant than ever before," Wingeforms wrote. "There is an ongoing shift in distribution platforms and technologies, involving both established companies and large new entrants. I am in general embracing new opportunities and technology advancements that will enable us to distribute our content more efficiently and to a broader base of fans and gamers. This will challenge established business models, make room for new business partnerships and present a wide array of new opportunities." Through Deep Silver, owned by THQ Nordic, it seems the publisher has already started to take advantage of these "new opportunities". Metro Exodus, which launched on Friday, is an Epic Store exclusive, at least for a year.